The MYA® LouCii stands 18” tall, offering easy portability and a great opportunity to put your creative mind at ease. Just like any MYA®, Dj LouCii has been marking his legacy with a worldwide impact. Dj LouCii works to make revolutionary changes to the EDM world, MYA® makes a revolutionary changes to the traditional hookah with the premiere of the MYA® XFunction™ technology. 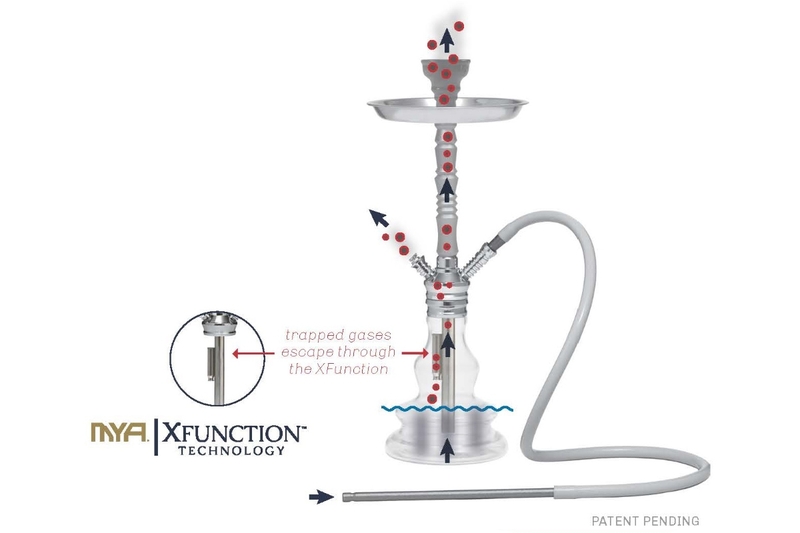 The MYA® XFunction™ is an internal purge valve system designed to eliminate the need to ever use any traditional cooling technique with your hookah again. The MYA® XFunction™, has been incorporated into the stem of our LouCii. MYA® XFunction™ will also clear out any gas buildup in the base while in use, effectively eliminating any stale or harsh smoke. MYA® XFunction™ and the LouCii, the perfect pair that will completely change your mindset allowing you to experience a timeless tradition at this new age level. LouCii by MYA® is not an EDM track - simply the perfect accessory for when you are enjoying his favorite tracks!